Camping Cala Ginepro offers mountain-bike hire in Sardinia to allow you to discover fantastic itineraries by mountain bike. Offering a winning mix of camping and sport, our campsite is a spectacular base for your sporting holidays! Thanks to their mild climate, which is more pleasant that the occasionally oppressive summer heat, spring and autumn are the best times of the year in which to head off on mountain bike excursions. At Reception, from April to October you can hire MTBs in Sardinia. We offer a wide range of professional mountain bikes for men, women and children; for half-day and full-day rentals, the hourly rate is subject to reductions. You can explore the wonderful natural setting of the campsite, in the vicinity of the town of Orosei, by taking for example the trails that lead to the wonderful Biderosa Nature Reserve. You will find an untainted environment overlooking the sea, infused with the unique colours and aromas of the Mediterranean maquis in which the campsite nestles. 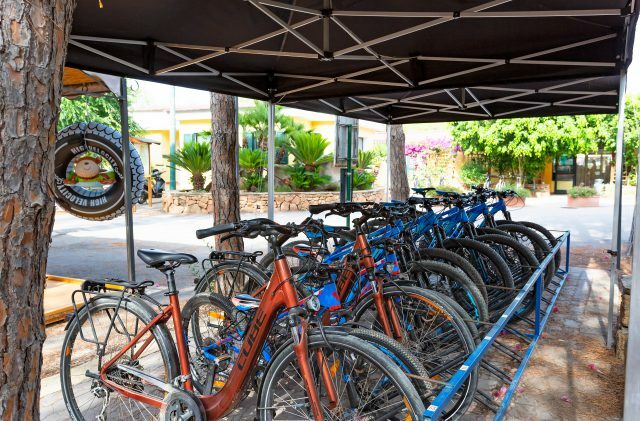 Along with the rental of mountain bikes, Camping Cala Ginepro also offers customised excursions to meet any set of requirements. Whether you are an expert rider or an absolute beginner, the local professional guides know exactly how to lead you around this part of Sardinia in the saddle of a mountain bike, in search of the most evocative locations that afford breathtaking views over the enchanting Gulf of Orosei. We have always been a sport-focused campsite, and we are great supporters of sporting holidays. Since 2007, Camping Cala Ginepro has been an integral part (and crucial logistical base) of both the Cross Triathlon Off-Road Xterra and Tnatura Italy competitions in Sardinia. The Cala Ginepro area is an earthly paradise for those who love Sardinia, sports and the Triathlon! You get a different sense of the beauty of our island in the saddle of a mountain bike – it will be a pleasure to welcome you here for your MTB holidays in Sardinia.